I know this is late for most people, but since I’m starting Tekh over the weekend I thought this was a perfect time to share this craft. I find it really hard to make crafts for this particular holiday as it is, though. It’s a pretty straightforward about its purposes and it’s hard to work with that at times. In spite of the challenge I decided a garland would be a nice holiday project. It also gives you a rare glimpse at my shrine. 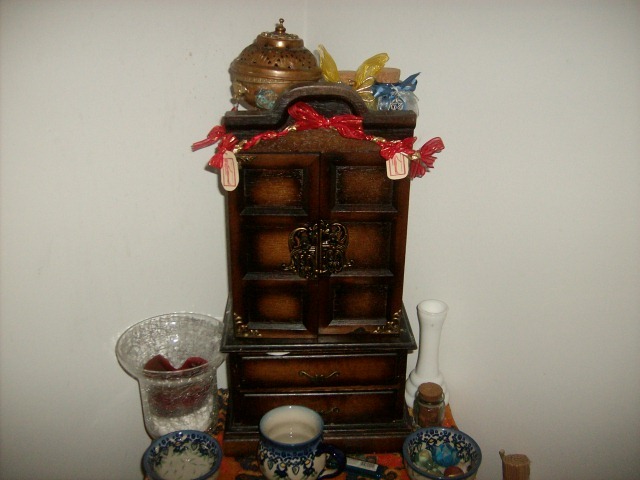 I didn’t have enough ribbon to do what I wanted this to do, but I had enough to decorate my shrine. 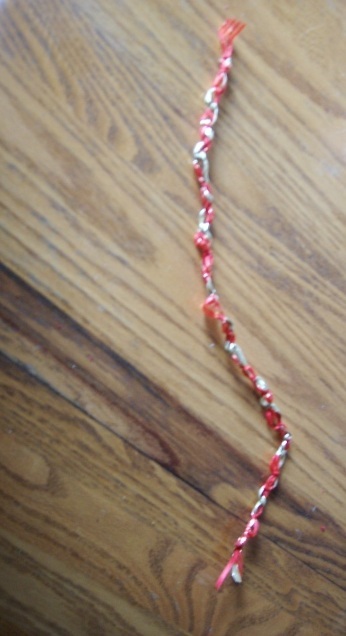 Also I couldn’t find bow wire, and the floral wire I found clashes with the ribbon. I ended up using beading wire instead. If you have any tips for this or recommend a place to get gold bow wire – I’ll even take red – tell me so in the comments. 1. 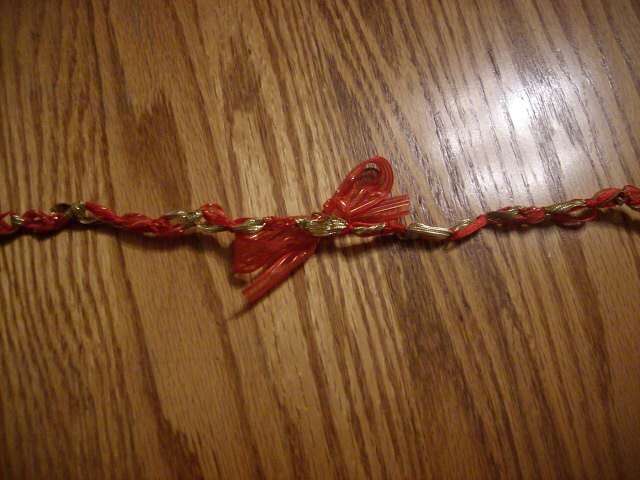 Tie the 3 feet long ribbons together. 2. Grab one ribbon and wrap it around the other ribbons. This should give it a shape like the number 4. 3. 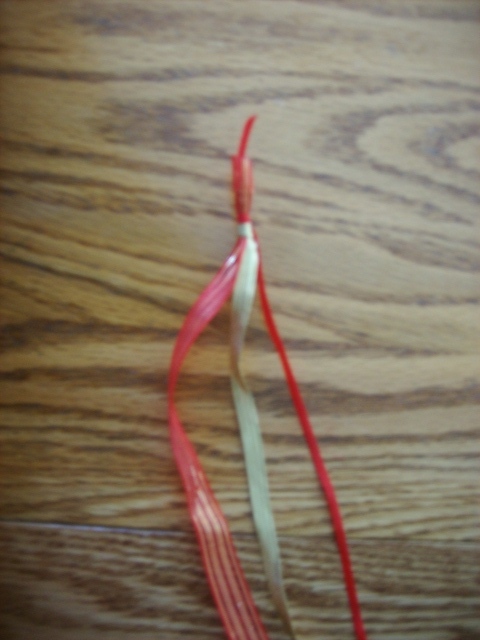 When tightening the ribbon to make a knot place the dowel rod in between the knots. Make a square knot around the dowel rod. TIP: This may require cradling the dowel rod while making the knot. 4. 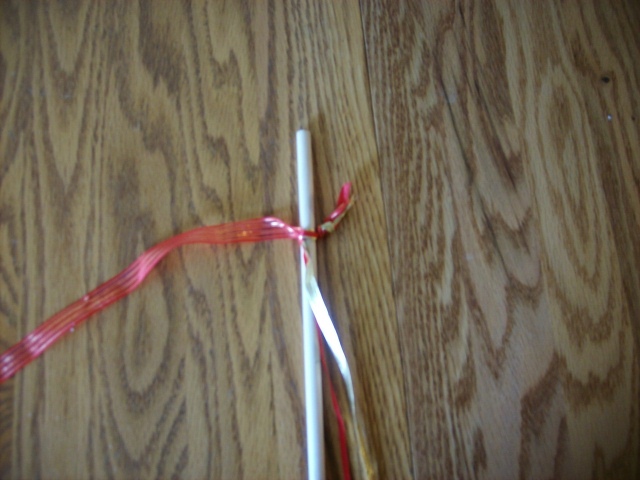 Make a second square knot around the dowel rod. Move the ribbon to the far left. 5. Repeat with the other ribbons. Tie a square knot at the other end. This will serve as a cord. 6. 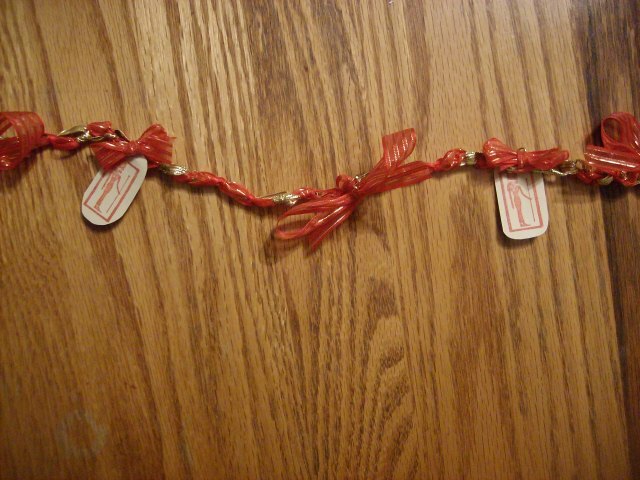 With the remaining 5/8 red ribbon make bows. 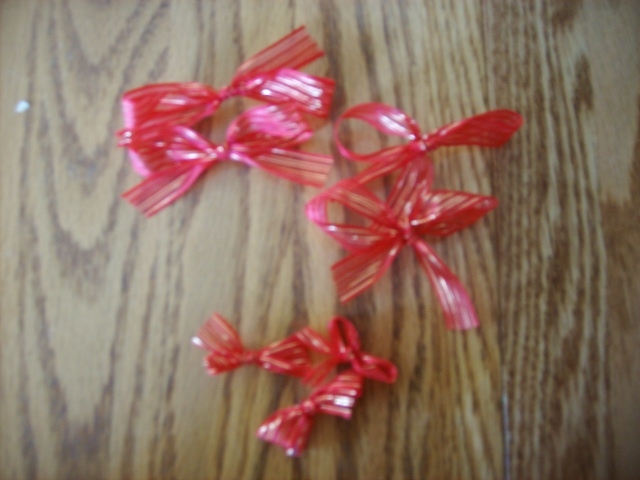 I made bows from 1 feet (the larger ones) and 6 inches (the smaller ones) of ribbon. I won’t however, use all of the bows. 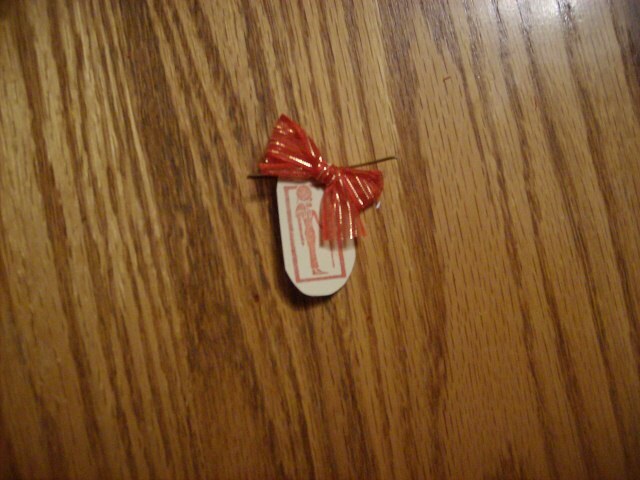 TIP: If the bows are hard to make tie a bow on a bamboo skewer, then pull off and tighten the knot. 7. Cut about an inch or two of the beading wire. 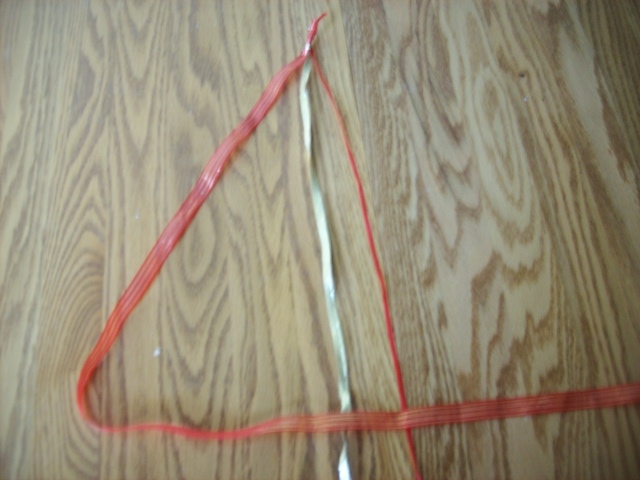 Thread the wire through one of the loops and through the knot of a bow. Wrap the loose ends with the needlenose pliers and tuck. 8. Repeat with the large bows. 9. 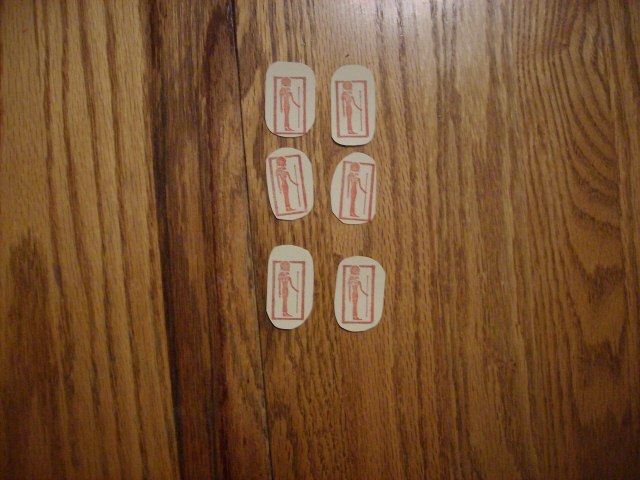 Stamp the cardstock with the Sekhmet stamp. Cut and trim. TIP: Save any leftover pieces stamped. It will come in handy if you mess up in the following steps. 10. Punch a small hole in the cardstock. 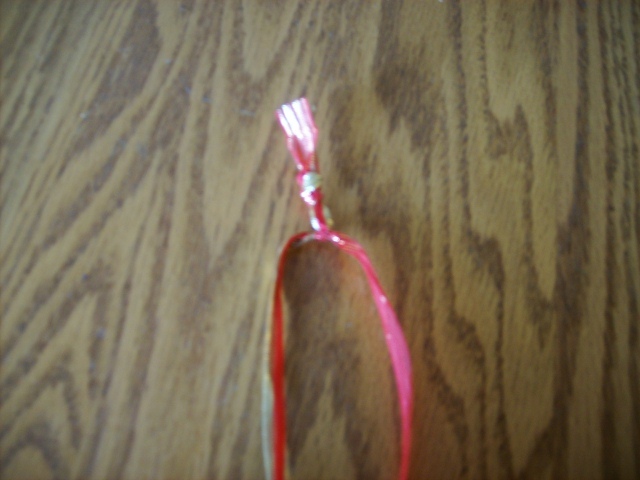 Thread the bow with beading wire as in step 7, followed by threading the cardstock. Use the needlenose pliers to tie it. 11. Repeat with the second small ribbon. I kept my garland fairly simple, but feel free to elaborate on it. I’d love to see any variations of this in the comment section. 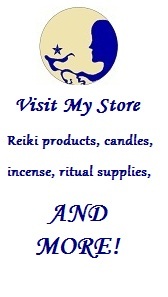 Categories: Craft Friday | Tags: Craft Friday, garland, holiday, Kemetic, NeoPagan, ribbon, shrine, stamping, tekh | Permalink. 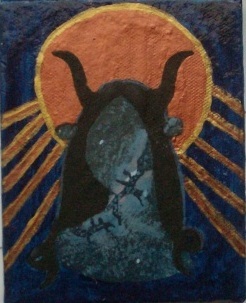 Some of you will remember the painting I showed the world, and thus my penchant for making bad art. After the encouragement of some of my readers and my co-sister-in-law I decided to salvage the painting. I’ll probably add to it still as I dislike how much negative space I left. Just the same I’ll share more of my saga with this painting. Categories: Craft Friday | Tags: Craft Friday, craft links, Kemetic, NeoPagan, painting, project | Permalink. Tuesday morning I observed Wep Ronpet, and how I managed to not burn down the house is a mystery to me. Almost everything that could go wrong did. Water spills, incense not lighting, candles not lighting that should have, natron spilling, cascading statues– or maybe they were jumping ship–you name it. I’ve had bad rituals before. Anyone who has been on this type of path has at least one bad ritual. Mishaps are common. This bad ritual took the cake and a good chunk of my patience. That wasn’t the worst part. The grand finale came after all my rituals. A cup of coffee I had on my craft desk got knocked over. Almost everything got drenched on top of the desk, my cellphone in a compartment got hit (after a day in rice it works again), books ruined, and all I could do was stare. The only silver lining is my computer’s harrowing escape from the coffee inundation and how no library books were in the flood plain. When I found my cellphone wasn’t working right and have to listen to family call me a loser behind my back. I lost it and was too exhausted to care. I’m self-soothing as I type. It’s funny because I had originally intended to write about starting a new stage of life, about something to anticipate. I’m not going to lie and say these events put a huge damper on it. I was going to write about the new hopes for employment, or at least my etsy store taking off. Either way being able to pay my bills would be nice for a change. I’m angry and out of patience at this point with everyone and everything. After some poor sleep and a failed attempt to improve my mood (though chocolate and hugs helped a bunch) I decided to examine my emotional exhaustion. These past few years have been very unkind to me in almost every way and is only compounded by my anxiety disorder. Trying to create a peaceful life has been a challenge, and one that sometimes I can’t meet. Days like this one really strike a blow to trying to live a peaceful life. On days where I fall flat on my face all I can do it get up. I pull out the proverbial toolkit and examine the situation. I understand I reacted the way I did not just to a ritual gone awry or the coffee inundation. I’ve found after some contemplation that like my views on grief, I find stress is cumulative. I’m not stressing about coffee inundations alone. I’m stressing about everything going on in my life and my focus was that stressor. Categories: Life Lessons | Tags: bad times, humor, Kemetic, life lessons, living, Ma'at, NeoPagan, new year, self, surrender | Permalink.